PRINCETON, NJ — More than eight in 10 U.S. small-business owners say they would still become a small-business owner if they had it to do over again. This sentiment has changed little over the past 11 years, which suggests that the difficulties many small businesses experienced during the Great Recession did not cause owners to regret their decision to start a business. These results are from the most recent update of the Wells Fargo/Gallup Small Business Index, based on telephone interviews with 600 small-business owners conducted March 31-April 4, 2014. From August 2003 through the first quarter of 2010, the Wells Fargo/Gallup Small Business Index regularly asked small-business owners about their decision to start a business, but did not ask this question in the intervening years until this most recent update. One of the key reasons many small-business owners would do it all over again is that they clearly value the independence they get from their choice of career, which no doubt is a part of their satisfaction with their career choice. When asked to name the most rewarding thing about starting and running their own business, over four in 10 talk about being their own boss and being the decision-maker. Other responses mentioned by more than 10% of respondents include having a sense of job satisfaction, having family time and schedule flexibility, and interacting with customers. 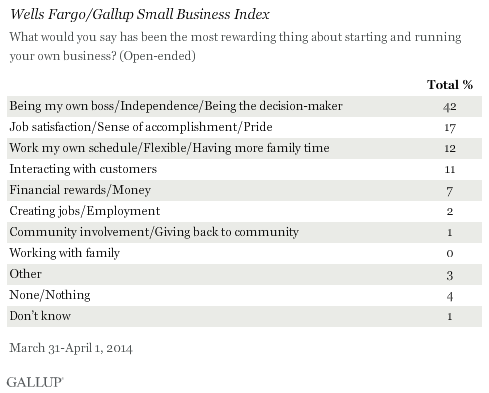 At the same time, small-business owners recognize that it’s a tough job. When asked about their biggest challenges, the majority of responses focus on the nuts and bolts of keeping a business running, such as generating revenue and a customer base, securing cash flow, obtaining credit and funds, and marketing and getting the word out about their business. Other responses that smaller percentages of owners mention include frustration with government regulations, employee issues, and dealing with uncertainty. 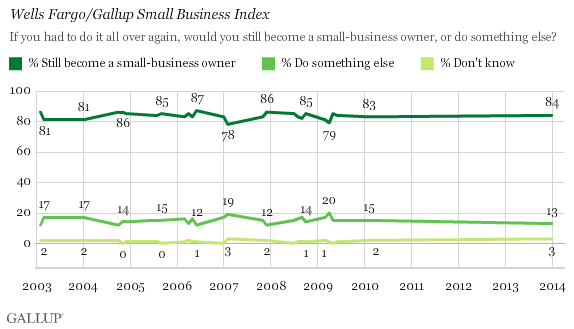 Small-business owners obviously like their choice of career, with 84% indicating that if they had it to do over again, they would still opt to start their own business. These attitudes have not fluctuated much over the past decade or so, and apparently the recession — which caused owners’ optimism to fall dramatically — still did not affect their satisfaction with their decision to start a business. Owners’ sense of freedom and independence derived from their entrepreneurship apparently overcomes the challenges of finding and keeping customers and maintaining enough cash flow to keep the business afloat. Results for the total data set are based on telephone interviews conducted March 31-April 4, 2014, with a random sample of 600 small-business owners, living in all 50 U.S. states and the District of Columbia.For results based on the total sample of small-business owners, the margin of sampling error is ±4 percentage points at the 95% confidence level. Gallup utilizes a Dun & Bradstreet sample of small businesses nationwide having $20 million or less in sales or revenue. The data are weighted to be representative of U.S. small businesses within this size range nationwide as well as by census region. For more information about Wells Fargo Works for Small Business, visit WellsFargoWorks.com.